I make my bed every day. I have since I was in about sixth grade. I don’t know if it’s a good habit or an obsession. I know I cannot leave the house without the bed being made…so it could be an obsession…! 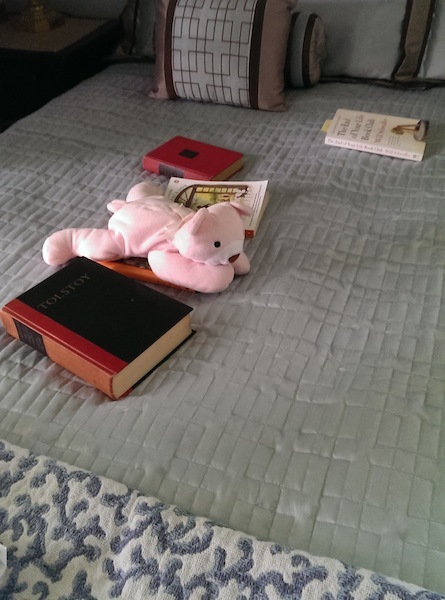 As I made my bed a few mornings ago, I realized that over the course of the past several weeks a collection of books had accumulated and were now strewn about the bed. This is not unusual. In fact, it’s the way my sleeping area has always looked. The books either are upon the bed or stacked untidily on the table beside my bed. That morning, I took mental inventory of where I was in each of the books pictured. I also took a photo of the books, exactly where they lay, and posted the image to Instagram. The photo is above. The little red one is a book of Russian short stories titled Best Russian Short Stories, compiled and edited by Thomas Seltzer. I started it about a month ago and have not gone very far into it. The book in the foreground, looking as if it’s placed to impress but is exactly to where it’s been maneuvered through the weeks, is Tolstoy’s Tales of Courage and Conflict, edited by Charles Neider. A funny thing about my approach to these two books. For years, I never got much from an introduction till I’d finished reading a book. So, nearly always, I read the introduction last. But lately, I like to studiously approach an introduction before I tackle the book and then again afterwards. So for the two books mentioned above, I’ve read the introductions and have begun the first story in each and have gotten no further. Though I intend to. The white book next to “Snuggly” (a super soft cuddly gift that was given to me by my daughter about 15 years ago), is Life Among the Savages by Shirley Jackson. I’ve mentioned in a past post that this book is a favorite, and one of my comfort books. Those of you who know Jackson for her five-page short story The Lottery, will be challenged to imagine how a book by Jackson with the title Life Among the Savages could be soothing! As it happens, it’s an endearing memoir of her years as a young mother of two, three, and then four children – the savages! I will write a review of it as soon as I finish the last quarter of the book. Underneath Snuggly, with just it’s orange edge showing is my own book, Love’s Compass. Recently I had it out to review a chapter I then posted here at sublime days in response to a photo challenge by another blogger who I follow. I left the book on the bed as I like to read a chapter of it now and then. It was the first book I wrote (in 2007) and I like to see how my writing has improved since, though Love’s Compass has a simplicity that adds to its appeal. At the top of the image is the book that shares my attention at the moment with the Jackson book. The book is The End of Your Life Book Club by Will Schwalbe. It was sent to me last week by my brother as he thought I’d find a kinship in spirit (my phrase, not his) in reading the parallels (his word) we experienced when my mother was dying. It’s a sad journey through this book but it’s also a way to revisit and honor the gift we had of caring for and loving my mother through every moment until that final one of solitary exit from this life. I’m about a third into this book. As I look at this collection of books, I see that they represent works that engage the reader in studies of the basic human experiences: birth, life, love, separation, suffering, joy, war, death. It’s no wonder that it’s about these things that I write. It’s to books of this style that I’ve always been drawn. Wonderful that you’ve read this book! I’ve never come across anyone who has! It was recommended by my sister-in-law many years ago and I read it then. She’s the only other person (till now!) who I’ve known to read it. It is charming and delightful! …and those are just the ones that are on my bed…! I grew up in a family where books and reading was highly valued and books were shelved in every room. I now am living in my childhood home – so many of the books are still here. In fact, the Russian short stories and the Tolstoy book mentioned in this post I found on shelves in the living room.